Deep Earth Academy (Consortium for Ocean Leadership) and the Integrated Ocean Drilling Program United States Implementing Organization (IODP-USIO) organized a teacher workshop at the IODP Gulf Coast Core Repository. 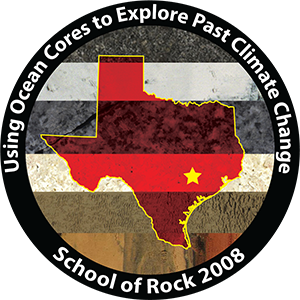 This year’s theme was “Using Ocean Cores to Explore Past Climate Change.” During School of Rock 2008, teachers were mentored and taught by scientists who are actively engaged in IODP research and by USIO education and technical staff. In addition, staff provided guidance and content related to hands-on laboratory activities. SOR 2008 followed SOR 2007, which also took place at the Gulf Coast Repository, and SOR 2005, which took place onboard the scientific research drillship JOIDES Resolution.